“A Little Tokyo Christmas” will grace the stage on Saturday, Dec. 15, at 2 p.m. at the Aratani Theatre, 244 S. San Pedro St. in Little Tokyo. Come and enjoy holiday music, dancing, laughter and a little Christmas shopping at the return of this holiday event. Don’t miss all the talented performers and community celebrities performing on stage and selling their crafts at the Holiday Gift Boutique, with proceeds to benefit free public programs at the Japanese American Cultural & Community Center. Produced and directed by Michael Hagiwara; musical direction by Dan Taguchi. 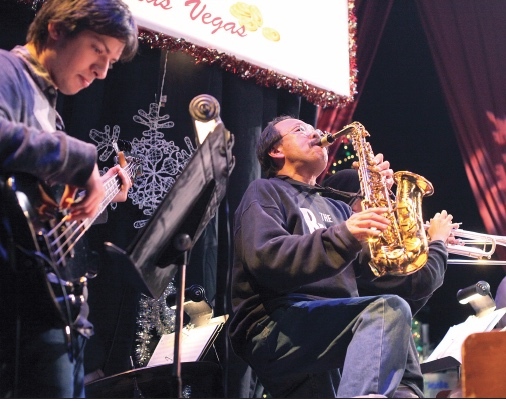 “‘A Little Tokyo Christmas’ started from a idea about eight years ago in 2010,” said Hagiwara. “I wanted to find away to bring the Little Tokyo community together for a holiday variety show. I got together with [actress]Emily Kuroda for coffee and started throwing ideas together. 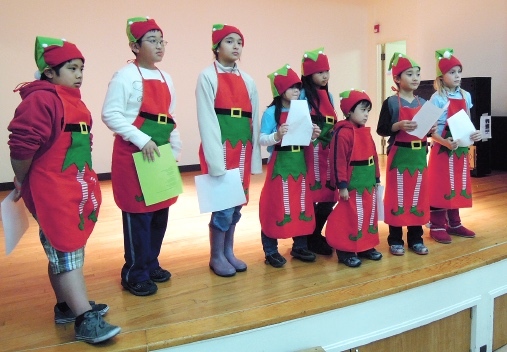 The elves listen closely during a rehearsal for the show, which arose from Michael Hagiwara’s concept of a community-based holiday revue. “The show brought together veteran performers from Broadway, East West Players performers and many other theater and comedy groups along with comedians and many celebrities. The show warmed the hearts of the community and brought rave reviews, so we repeated it in 2011 but have not done the event since. Fong’s segment will feature Aaron Aoki, Takayo Fischer, Loryce Hashimoto, Haruye Ioka, Kurt Kuniyoshi and Ping Wu. Also joining the fun will be a senior citizen ukulele group, trapeze artist Kennedy Kabasares, some taiko, some hula, celebrity co-hosts, and many surprises. The Christmas boutique is back with unique crafters to create the full experience for the people who come to the show. Musical director Dan Taguchi on saxophone. “These last couple years have really divided our community and friends. Like the song says, ‘We need a little Christmas now,’ so I’m hoping to bring that to Little Tokyo,” Hagiwara added. Performers include Jaime Barcelon, Kerry Carnahan, Marlene Yamane Chau, Zoe Chau, Janelle Dote, Lisa Horikawa, Yumi Iwama, Rodney Kageyama, Keiko Kawashima, Chanel Akiko Kipper, Darrell Kunitomi, Michael Murata, Clara Mulligan, Helen Ota, Mike Palma, Tripp Pickell, Diana Toshiko, Reuben Uy, Samantha Valdellon, Lit Villareal, Gedde Watanabe, Greg Watanabe, Allen Lucky Weaver and Grace Yoo.